Dubs’ U16 boss, Pat Kane is busy preparing his team for this weekend’s All -Ireland semi-final clash with Armagh. 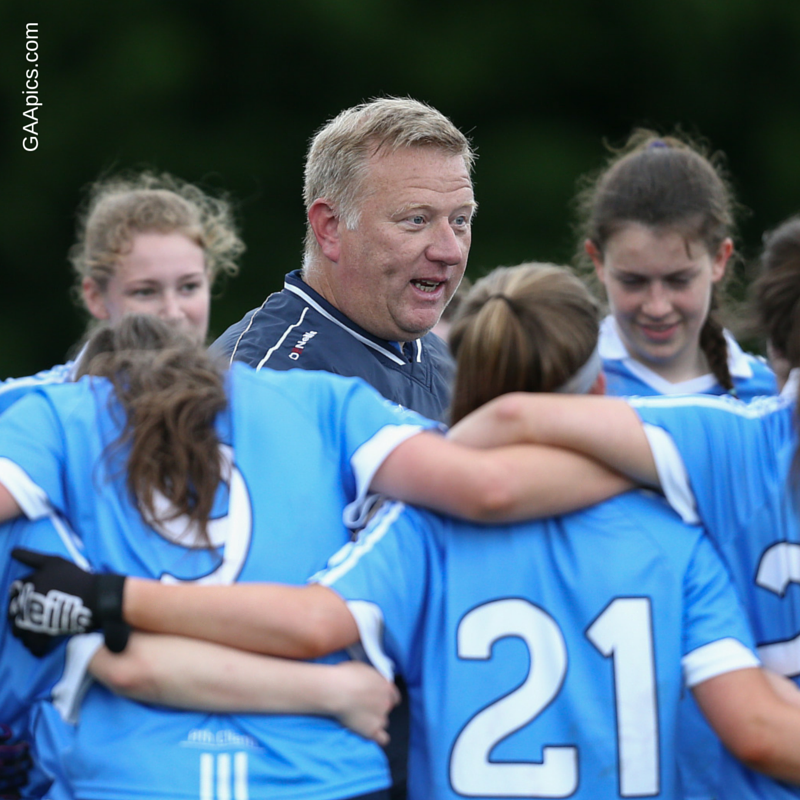 Pat is heavily involved with his club Clanna Gael Fontenoy but he also has a deep passion for Dublin football and would love nothing more than to guide this current crop of U16 stars to an All-Ireland final. Ahead of Saturday’s game in Drogheda (1pm throw in time) we caught up with the Dublin manager- check out what he had to say …. Q. How did you come to get involved in managing / coaching Ladies Gaelic football? Our Club team was stuck for a manager/coach and my sister who played on the team persuaded me to get involved. Took a lot of persuading initially but never regretted it for a minute. Q. Which football or sporting manager past or present do you admire the most and why? Not a huge soccer fan but huge admiration for what Claudio Ranieri achieved with Leicester City in the premier league this year. Anyone can achieve success with big numbers and big money but it took real class and ability on his behalf to win like they did, No nonsense or histrionics from him either an indication that sometimes nice guys do actually win. Q. What has been the best and the worst moments of your management career so far? Maybe somewhat surprisingly winning our first ever ladies football championship in 2005 with Clanna Gael Fontenoy was the undoubted high point, a huge event for all those involved at the time and still talked about in club today. Low point was losing U14 All Ireland semi- final to Mayo in 2014, we’ve lost games in the past couple of years that we truthfully deserved to lose but that was definitely a game we should have won. Q. Who was your sports hero growing up? Brian Mullins, A real Dublin Legend, To this day he is in my opinion the best Midfielder I ever had the privilege to see playing the game. Q. Tell us about your first game in charge of a Dublin team, what was the experience like? A very nervous but enjoyable experience, certainly more pressurised than anything I experienced at club level. It was against Meath and we won, always great to beat the Royals. Q. Which team was the toughest opposition you ever faced? Cork and Kerry without a doubt with perhaps Cork just shading it. Q What sporting event in the world would you love to attend? I’d Love to go and see various finals and disciplines at the Olympic Game’s. Q. Which sports would you watch apart from Gaelic Games? I’m a massive Rowing Fan, still involved in local rowing club in Ringsend and watch and participate every week from March through to August, The only sport that I’d ever consider missing a GAA game for. Q. Apart from Dublin of course what other team (any code) would you like to manage? No ambitions outside of Dublin/Club Gaelic games, As a Dub I’d only ever be interested in my own County and trying to contribute as much as I can in the time I’m involved and obviously your heart is always in your club and you would simply have to do what’s asked of you on that front. Q. If you could change one rule in Ladies football, what would it be? I’d leave the rules alone, they’re just fine as they are but I would ask the referees to apply them consistently. Q. If there was a transfer market in Ladies football, which player would you like to see sign to Dublin and why? Looking to the future I’d sign the Laois U16 Emma Lawlor, the most complete all round player I have encountered while involved with Dublin, A huge player for Laois and may not always get the recognition she deserves, felt like she was playing us on her own at times, if she was a Dub the whole country would know about her soon enough. Q. With the recent sponsorship investment in the LGFA by LIDL along with the announcement of one million in government funding for Ladies football and Camogie, do you think enough is being done to promote women in sport? I think that in the past there was a lot of lip service paid to women’s sport but in recent times there is definitely a far more positive attitude towards it. Perhaps due to success at international level by the likes of Katie Taylor or the huge increase in participation in sport in general and Ladies Gaelic Football in particular. I think we’re going in the right direction but its early days yet with lots of opportunities and challenges ahead.